· Note: These figures will ship open boxed, as we will be inspecting each figure’s QA. Wing joints on this figure are sensitive. Tomenosuke + Circus Posterus (T+CP) is delighted to announce Monsters & Misfits IV, an exhibit of new work presented in collaboration with Tomenosuke-Syoten. 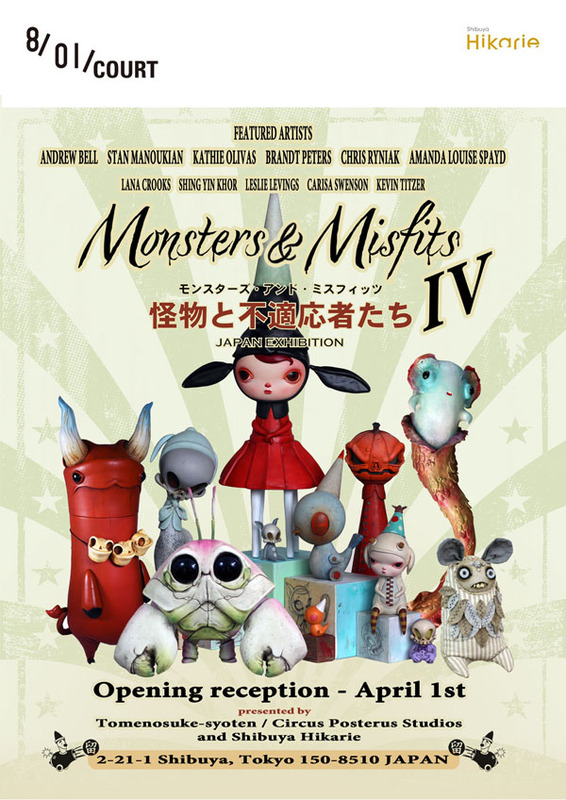 This is the first Monsters and Misfits in Tokyo (Japan) and will be on display at Shibuya Hikarie at Creative Space “8/” from April 1st – 7th. 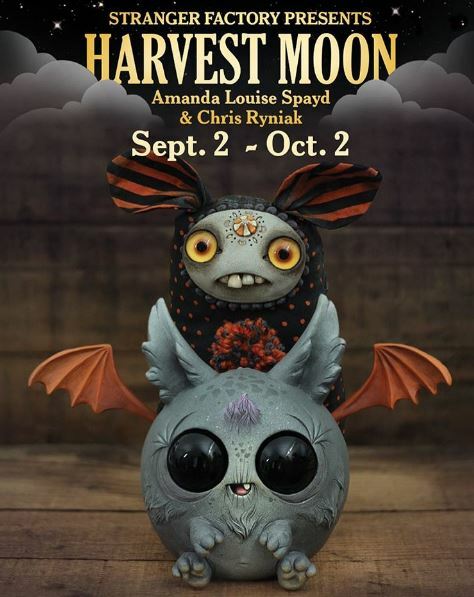 Monsters and Misfits IV will feature returning artists Brandt Peters, Kathie Olivas, Amanda Louise Spayd, Chris Ryniak, Andrew Bell, Stan Manoukian, and Carisa Swenson. Shing Yin Khor, Leslie Levings, Lana Crooks, and Kevin Titzer join the returning exhibition as new additions to the roster. 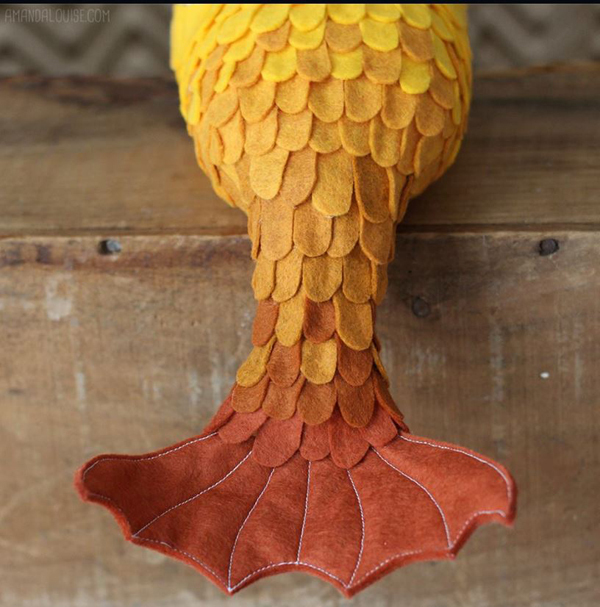 This museum level exhibition will bring you through a parade of strange and fantastic creatures and characters from these top contemporary designers, toy makers, and fine artists. 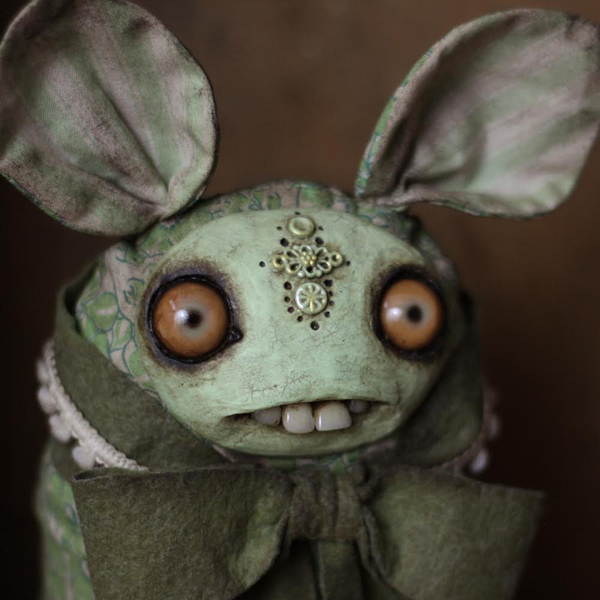 This year’s group of Circus Posterus’ artists and guests present a hand-made sideshow of beady eyed night critters, devils, reptilian oddities, mouse kings, kappa skulls, ghost children, and more that promise to leave you awash in starry-eyed wonder. 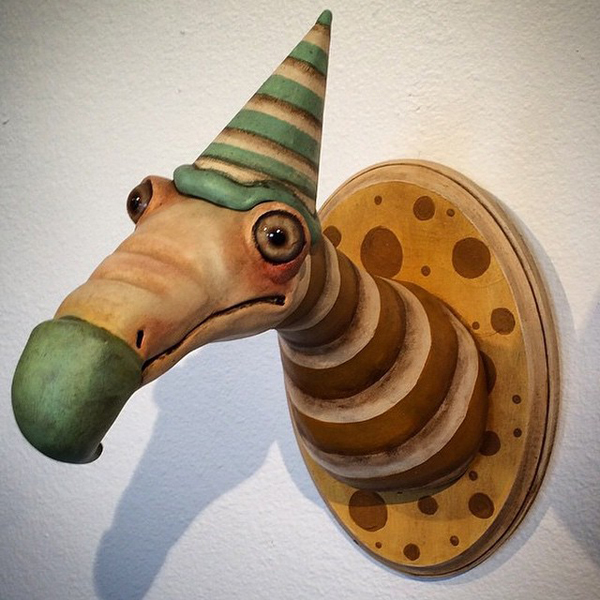 The fourth installment of this show features primarily hand made toys and sculptures inspired by cryptozoology and an idealized, re-imagined animal kindgdom. 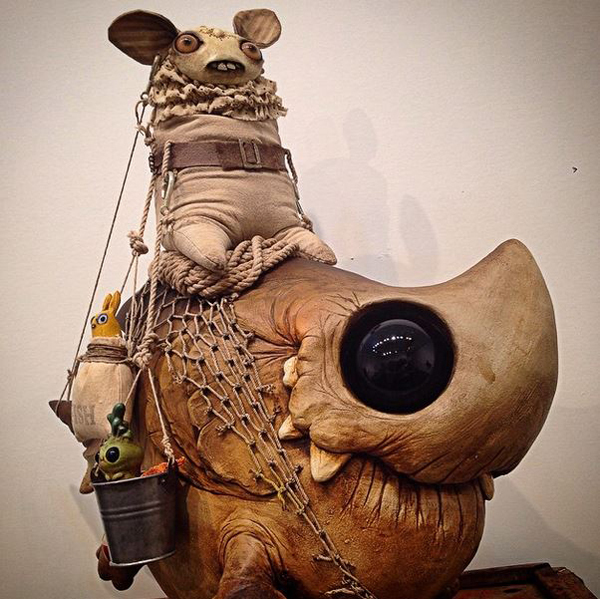 Andrew Bell, Stan Manoukian, Kathie Olivas, Brandt Peters, Amanda Louise Spayd, and Chris Ryniak will be attending the opening reception on April 1st. To purchase original artwork and, or view the Monsters and Misfits IV exhibition online, please visit www.tomenosuke.com on April 2nd (11 AM local Tokyo time) when the web preview is launched. 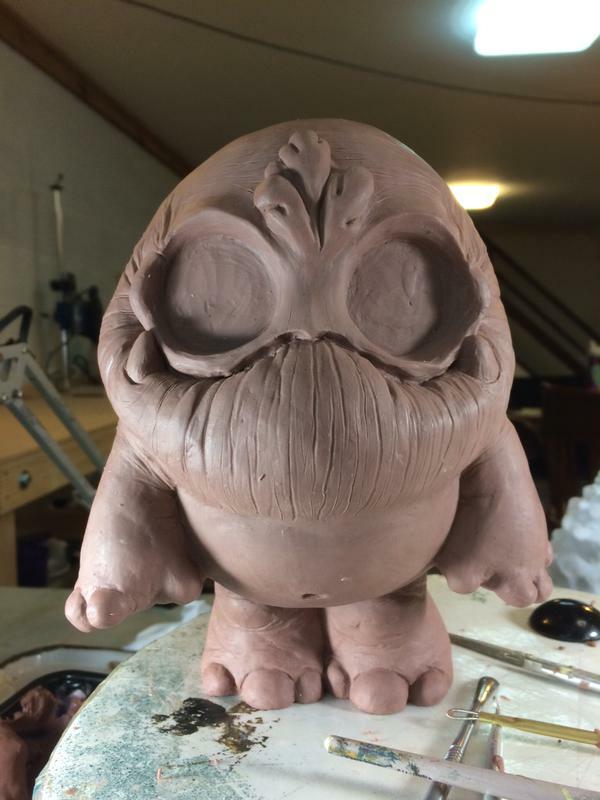 Please contact Tomenosuke.com directly for any Monsters and Misfits IV purchase related questions. Press images and additional promotional artist information are available upon request from our Press Manager. The exhibit will run April 1st to 7th at Shibuya Hikarie in Tokyo, Japan, with an opening reception on April 1st. Time to jump right in to more San Diego Comic Con goodness! 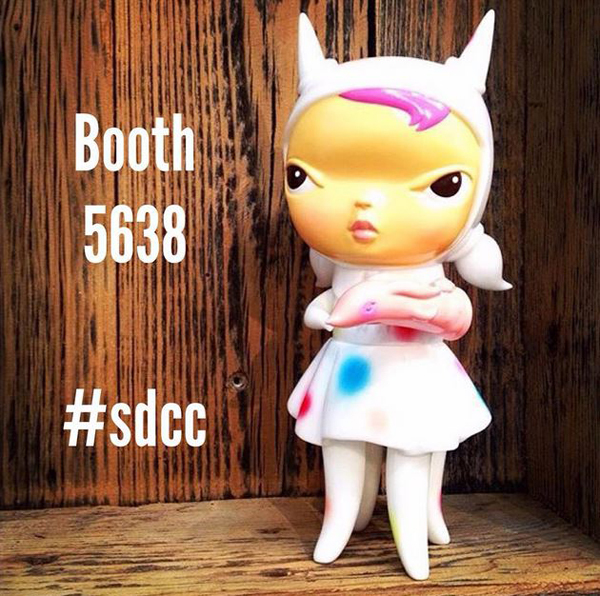 Clementine is coming to ‪#‎sdcc‬! 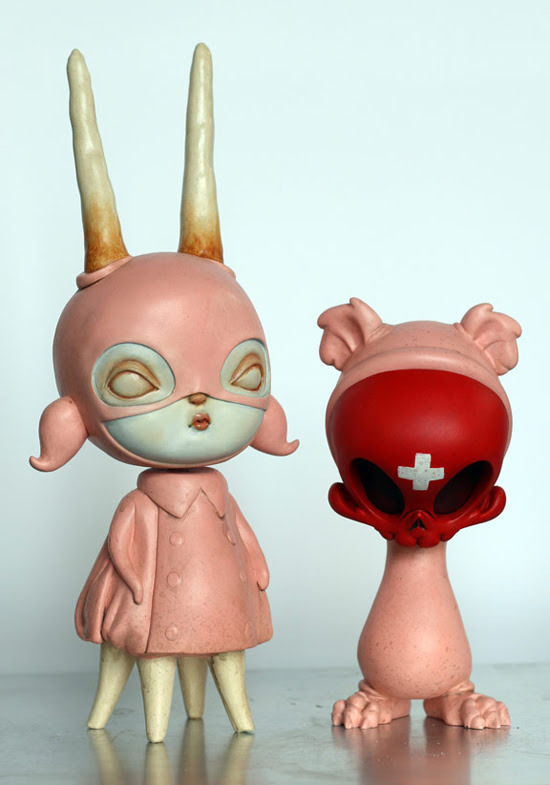 This amazing lass by Kathie Olivas and produced by Circus Posterus x Tomenosuke is limited to only 100 and will have a general release after the con. 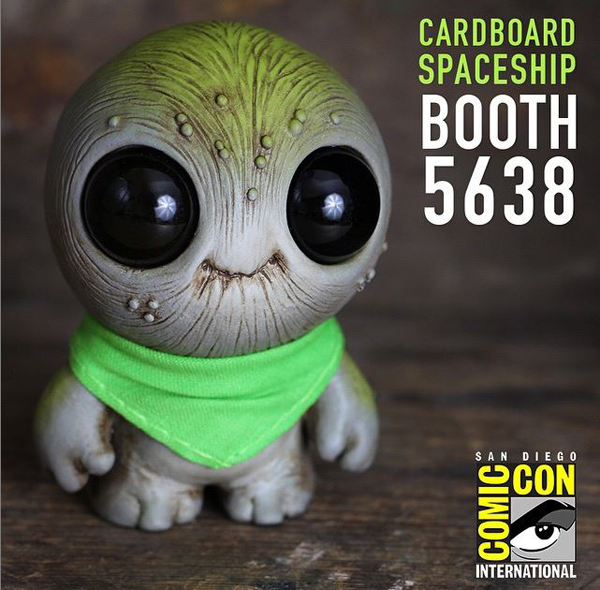 Lucky for you #sdcc goers, we are bringing a few to Cardboard Spaceship booth 5638! 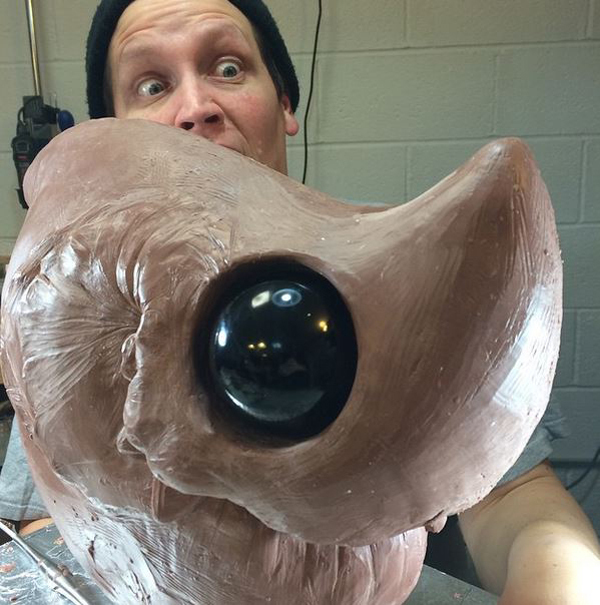 Booger Bandana Grubthum by Chris Ryniak will be available in very limited quantities starting this Friday, July 10! Cardboard Specaeship does it again with an Amanda Louise Spayd ‪#‎sdcc‬exclusive! Limited to only 100, this “tropical” version of Clover from the upcoming Thimblestump Hollow mini series! Well, we were not scared one bit to dip our toes in the salty waters, and with a name like Safe Harbor, we knew everything would be okay. 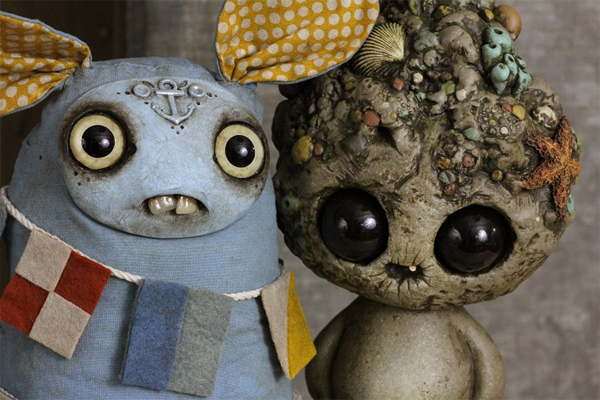 Here is our look at Chris Ryniak and Amanda Louise Spayd’s “Safe Harbor“. 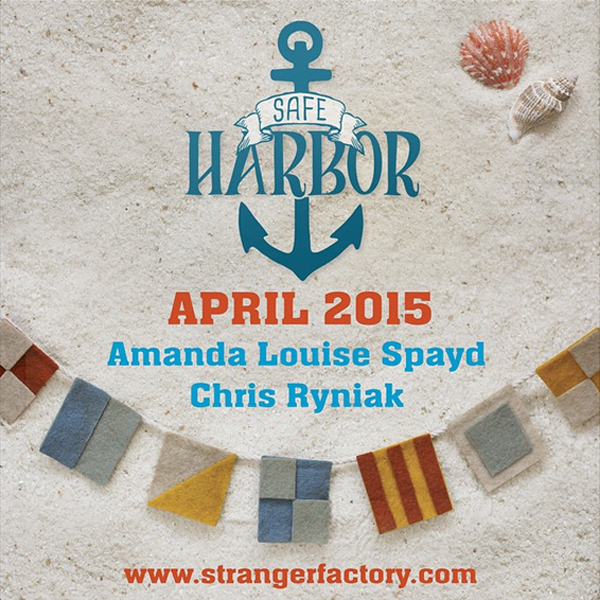 The sea creatures are stirring, and the waves are rolling in for Chris Ryniak and Amanda Louise Spayd’s “Safe Harbor“. We have been catch and releasing all kinds of progress images for the show on social media, but look no further now – because we have them packaged like sardines in one blog post for you. You can see all manner of sea beasts from mermaids and sharks to crabs and dudes we can’t even describe properly in their most early stages. Go ahead and start drooling on some of these. 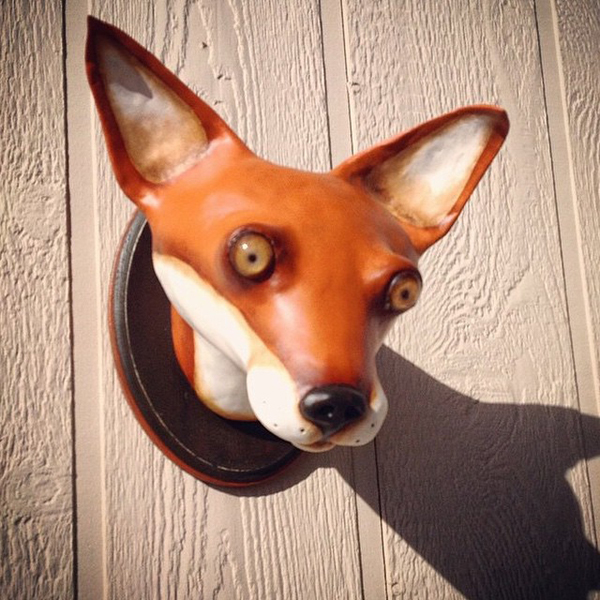 The Safe Harbor opening reception is Friday, April 10th from 6 – 9 pm at Stranger Factory. Both artists will be in attendance. 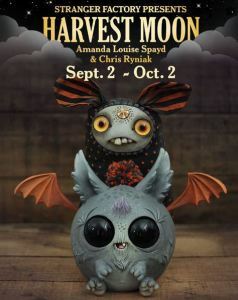 Ohio artists Chris Ryniak and Amanda Louise Spayd are back with another collaborative exhibit, “Safe Harbor”. 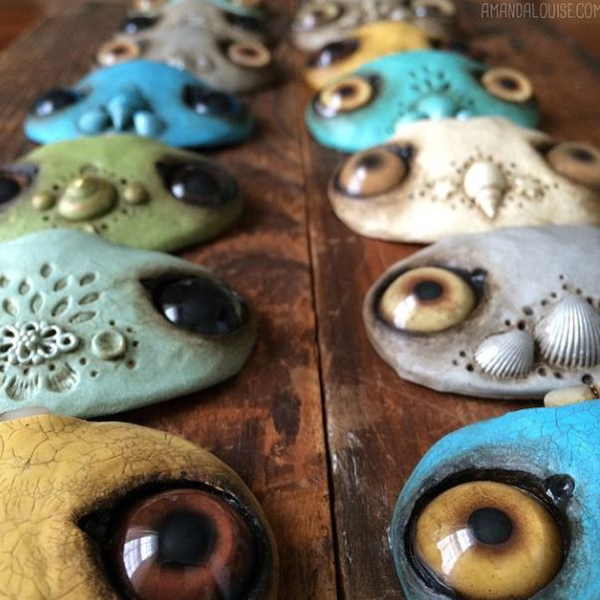 Moving away from their usual land-locked world, the artists breathe new life into the creatures who make their homes both above and below the boardwalk. The artists have collaborated on some of their most ambitious new works yet, both stepping out of their comfort zone to tackle an entirely new breed of their well-loved creations. They’ve envisioned a world revolving around a dilapidated old wharf, worn by time and salt, inhabited by creatures both new and familiar. 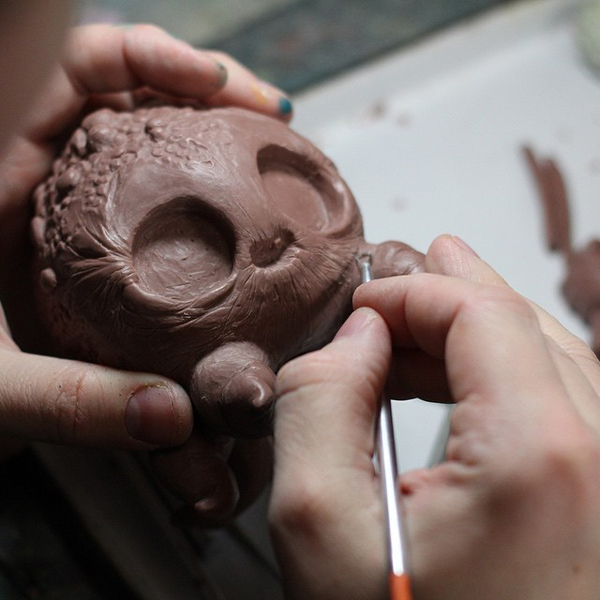 This fresh and unexplored world has led both artists to craft bold, new creations; some of Spayd’s original Dust Bunnies have grown fins, adorning themselves with shells, crab claws, and fishhooks, while “Safe Harbor” will also reveal plenty of fresh, sea-dwelling additions to Ryniak’s usual roster of meticulously sculpted characters. This is the fourth large-scale collaboration by Chris and Amanda, and as they continue to share ideas and inspire each other, their creations have found themselves cohabiting the rotting planks and watery depths of their own crumbling coastal paradise. 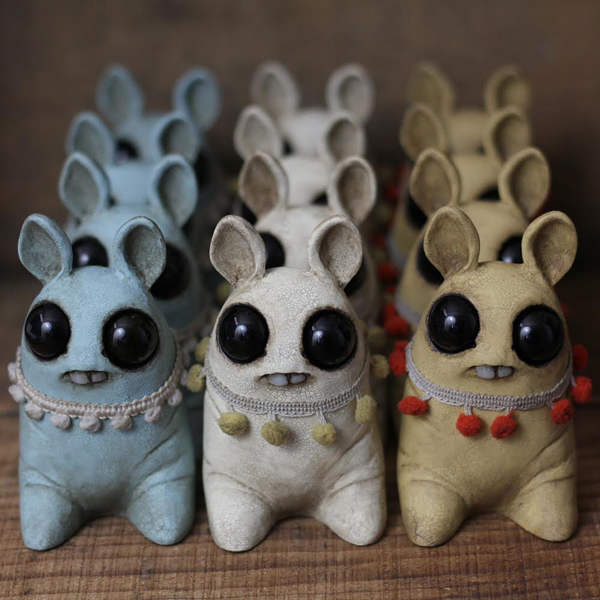 Join us at Stranger Factory as we drop anchor and spend some time with this fantastic new family of creatures from two of our most popular artists. 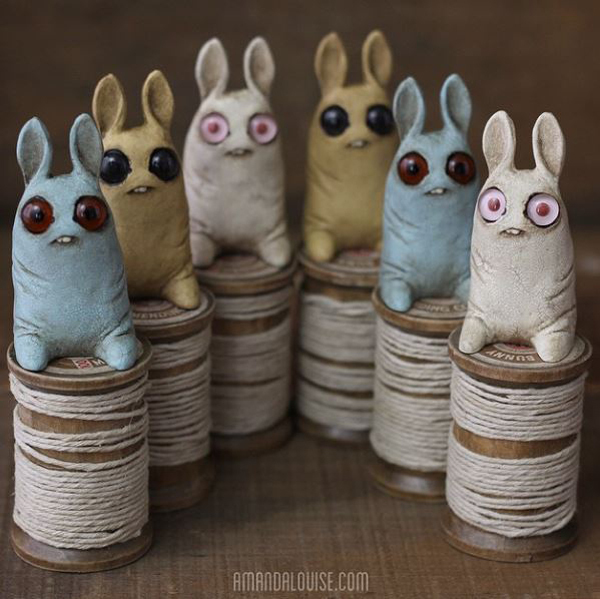 The opening reception is Friday, April 10th from 6 – 9 pm at Stranger Factory. Both artists will be in attendance. Off with their Heads again! One of the awesome things about the Pocket Sideshow Chibi series, is that you can swap all the heads and bodies! We did just that with a set of the Winter Colorway set. Makes for fun combos and mixing it up. Works well if we say so ourselves! Grab your list and check it twice, because here are more Designer Con releases and exclusives! More exclusives and releases soon!